Boston Police have made an arrest after a suspect allegedly shot a store worker in front of his wife and his 12-year-old son. 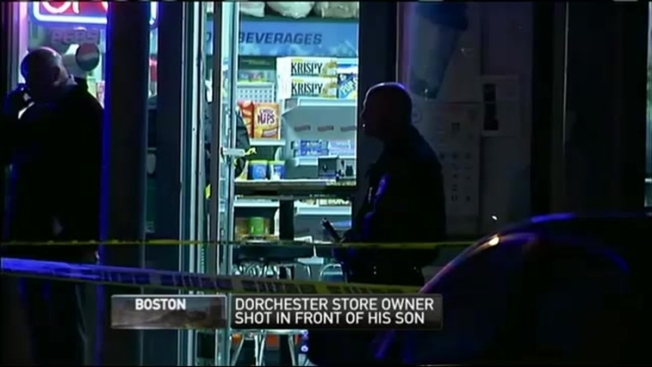 Police say an employee at D&D Convenience Store on Dorchester Avenue was shot around 8:30 Tuesday night. The 46-year-old man was transported to Boston Medical Center and remains hospitalized, but is expected to survive. Police say the suspect entered the store, showed a gun, demanded money, shot the worker and ran off. Jarris Charley, 21, of Roxbury was arraigned Wednesday on charges of armed robbery while masked, assault with intent to murder, assault and battery with a dangerous weapon, unlawful possession of a firearm, and unlawful possession of ammunition. A judge also revoked Charley's bail in an open case out of West Roxbury Municipal Court charging assault and battery and destruction of property. Charley will return to court Dec. 4.